+ I really hope our washing machine is fixed for real this time. Repair attempts (under warranty) have been made three times in the past month. I've been too chicken to run a load to see if it works. While laundromats are an option, they are not my favorite for several reasons-- the chiefest being that I used to work at one while I was in college. Laundry by the pound for college kids is gross. + There are a couple of elderly widows at church that I would like to become better friends with. Not only because friendships are a blessing that runs both ways, but because old people are just fun, y'all. They have the most interesting stories and will often surprise you with a sharp and quirky sense of humor! + My sister Lele is prego and due in January. Her and her husband have taken to calling the baby different names according to its growth-- names such as sesame seed, blueberry, garbanzo, and lemon. The only problem with that is that I keep picturing her having a lemon in her belly! I know that is an absolute impossibility because I've seen her ultrasound pictures. When *I* was prego, we simply called the baby "baby" until we came up with their name. 1.) Did you have any special names for the little peanut-chicklet-baby in your belly? 2.) Do you ever speak in baby talk? Y'know, that annoyingly high pitched ridiculous voice that no baby could possibly understand? Once in a blue moon I catch myself speaking like that and must teach myself a lesson by washing my mouth out with soap. It's a wonder I ever get any sleep around here, what with all the profound and intellectual contemplations that bombard me in the dark hours of the night. Like you, I just called it a baby. Not too creative I know. 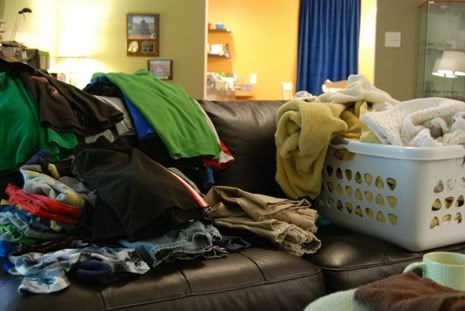 Love your pile of laundry, it doesn't look NEARLY as bad as mine. :) Love you!!! oh MY! I love the new template!! So you. You know...night owl and coffee. Perfect. And the frog at the bottom...perfect! I think that we just called them baby. We never found out ahead of time, so we had to be gender neutral. When I was preggo with my now-2-yo, we were studying Early American History. I told the kids that the baby could hear what we were saying. That day we happened to be studying Squanto and they thought it was the funniest word for the baby to hear in my tummy. From then on they kept saying that it would be great if the baby's first word was Squanto. To this day, they still get him to say Squanto and then go off in a fit of hysterical mirth. I too referred to our little one to be as "baby". Gesh,this post makes me wish I was pregnant again. How exciting for your sister and for your family. Also glad to know I'm not the only one having deep profound thoughts at night when I should be sleeping. Although I have to say yours are at least logical. Mine jump all over the place and resemble someone with ADD or HDAD or whatever they are calling it these days! I am not a big fan of laundry mats either, but I am thankful for them when my washer is out of commission. :-) Hope your washer is back up and running well soon. I agree, old people are so much fun! It's a blast to sit around and listen to their stories...and glean from their wisdom! I hope people think we are fun when we are old. When I was pregnant, we called him "Peanut" in the beginning and then "Pumpkin" toward the end. with our first we called the baby kennoahdy ... if baby were a boy, he would've been noah, if a girl, kennedy. @ 17 weeks they said boy so we started calling baby noah, @ 20 weeks they were most postive that noah was a girl and they had made a mistake @ 17 weeks, so thereafter we called her kennedy and apologized daily for having called her noah for three weeks. looks like you've been here longer than i thought. i'm still reading on my reader. are you updating both blogs? i'm going to subscribe to this one. it's so pretty here. Well, most of my pregnancies were just "baby." But Trouble... he was called "Trouble" since I was 12 weeks along. We kept saying, "This baby is going to be Trouble... with a capital T." Boy were we right. I have a thing for old folks, too. I adore them and have the urge to cook for them, feed them and bring them treats. So, I just wanted to say that I'm in full agreement about making friends with the 'tercer edad' or elderly as we like to say in English ;) and we have LOTS of friends that are older. They are GREAT. I love how they lived what we think of as history. Okay. Gotta go. I'm working on inventory-ing my kids clothes and all my homeschool books because I'm making a trip back to the STATES! whoohoo! I've got to get stocked up and my MIL bought a ticket way back that we didn't get to use until now... and SO, the girls and I are making a voyage! Yay. See you. I WISH I was going to be in TEXAS my friend! Love you.